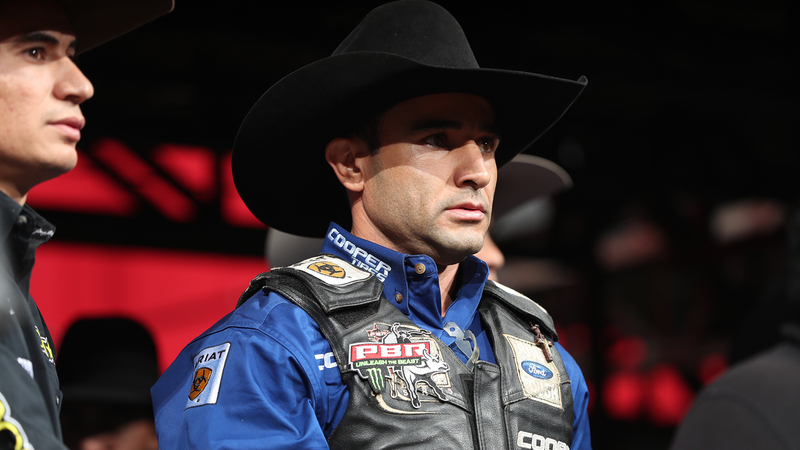 PUEBLO, Colo. – Joao Ricardo Vieira had just taken over the lead at the Ak-Chin Invitational, presented by Cooper Tires, on Sunday afternoon in Glendale, Arizona, when he glanced down. On his shirt was a sticker in honor of Mason Lowe. Vieira had been in Denver five days earlier when Lowe was stepped on during the PBR Chute Out Velocity Tour event at the National Western Stock Show. “I am very sad because I stay in Denver and was there when Mason was stepped on,” Vieira said. “It was two riders before me. I saw him on the ground and it was so difficult to come here. All week we have had to fight through this. Vieira elected to not ride Wednesday night in Denver. Lowe’s passing brought back memories of four and a half years years ago when Vieira lost one his best friends in Brazil during a bull riding accident. Cleverson Martins Adao was a bullfighter and was stepped on by a bull at a rodeo in Alvinlandia, Sao Paulo, in 2014. Vieira, though, knew he had a job to do this weekend in Glendale, and he wanted to honor both Lowe and Adao’s legacies. The 34-year-old went 3-for-3 and won his first premier series event since September 24, 2016. Vieira earned the victory in Glendale by riding Shelley’s Gangster for 87.5 points in the championship round. He then watched on as four of the final five riders all bucked off their bulls. Lucas Divino rode Big City for 83.5 points, but it was not enough to usurp Vieira atop the standings. Vieira’s ride was one of two he made away from his hand, which has been a struggle for him since he became a common name on the premier series during his 2013 Rookie of the Year season. He began his desert weekend with 85.5 points on Squirrel away from his hand before riding Red Sails in The Sunset for 82 points. “It is the same,” Vieira said. “It is more mental. For a bull away from my hand, I need to move more. More fast. You need to say I can keep doing more and more. Or you buck off. 2016 was the last season in which Vieira was in contention for the World Championship. Vieira was a perennial contender from 2013-2016. During those four seasons, Vieira finished in the Top 5 every year, including two third-place finishes and one runner-up finish in 2014. Vieira is now back in the world title conversation following a 21st-place finish in 2018 and 12th in 2017. He heads into the Sacramento Invitational ranked sixth in the world and is 1,307.5 points behind world leader Jess Lockwood. Vieira was 1-for-9 at all levels of competition, including 1-for-5 on the premier series, before finding a $34,185 payday. Two of those buckoffs happened at the PBR Brazil event in Goiana, which cost Vieira the opportunity to finish in the Top 3 of the 2018 PBR Brazil standings and earn a spot on Team Brazil for the upcoming 2019 WinStar World Casino & Resort Global Cup USA, presented by Monster Energy, on Feb. 9-10 in Arlington, Texas. Vieira finished 10 points behind Brazil No. 3 Joao Marcelo Santos. Vieira – a seventh-year pro – said that retirement has crossed his mind, especially after the past week, but he is not ready to hang up his bull rope just yet.